It has been another busy week around here. I've been walking, painting, packaging, rearranging, doing housework, grocery shopping and lots of fun stuff. I'm going to make this a really short post as I still have tons to do. For quite awhile I have seen this cute pink jeep around town and every time I see it, I think, "I should get a picture of this for Jessi." Well, I finally did. So Jessi, this is for you! What you can't see in this picture is the huge Barbie logo on the hood, but if you click on it you can see the little one on the side and the "Mattel" license plate. So cute! I saw on the news Barbie has added ink. Does it have a tattoo ??? Cute... I could drive around in it and I'm a senior....I know I could still have a few good times picking up my senior girlfriends and off we go. That is way too cool. Wouldn't that be fun. Can you imagine the looks you would get? I have a big deer guard on my expedition and people are always looking at it in amazement. We live in the higher elevation where the deer come out at the dusk, so it is protection for our car. Also when we go over to Montana there are several areas that they dubbed highways "deer alley", so our timing was right to have one. ohhhhh!! I will have to keep my eyes open for this...cute!! Lisa I can't wait to see what you have been working on! 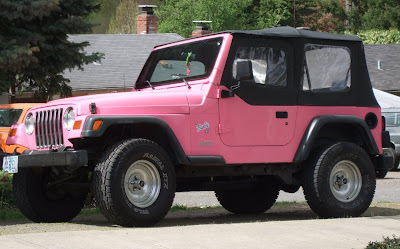 i love pink jeeps. so cute. i have seen a pink hummer, not as cute as this jeep.